Five minutes is all it takes to make this oh-so-tasty Taco Popcorn recipe which makes the perfect healthy snack. With my husband chaperoning Mr. 14 at his first 4-day golf tournament in the Hunter Valley, NSW, my daughter and I had a simpler (and less noisy!) week to ourselves. This translated to uncomplicated dinners, noticeably less housework and nightly chick flick sessions cuddled up on the lounge. And what goes perfectly with movies? Popcorn! But not just any old popcorn. I’m talkin’ serious stuff now. And seriously, Taco Popcorn is our new favourite snack! 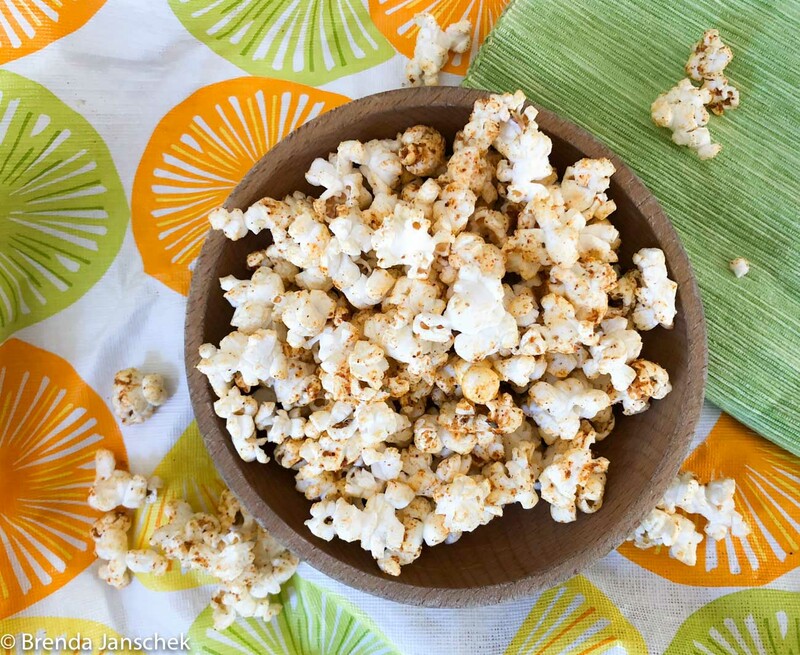 Versatile enough to be enjoyed with margarita’s by the pool as well as in the school lunch box, you’ll love how easy this tasty popcorn it is to make! Making popcorn is made easy with my popcorn machine, but you can certainly make it the old fashioned way in a saucepan as I explain in the recipe below. I highly recommend making your own taco seasoning. It’s easy, delicious, cheap and a much better option than the store bought varieties which are full of preservatives and artificial colours. If you make a batch of the taco seasoning and have some leftover, mix it through your guacamole dip, add it to to your tacos or to my delicious Tex-Mex Burrito Bowl. In a small bowl mix together the chilli powder, paprika, cumin, garlic powder, onion powder, salt and cracked black pepper. Or, over medium heat up some olive oil or coconut oil in a medium saucepan and once the saucepan is hot, add in the popcorn kernels, pop the lid on and shake the pan to evenly disperse the kernels. Pour popcorn into a large bowl and add half the taco seasoning, taste test, and add more to suit your tastebuds then pour over the melted butter and stir very well. There are more wholefood snack recipes in my ebook Real Food For Hungry Teens. Here are a couple other easy recipe ideas you might like – Chai, Date and Sesame Biscuits and Crunchy Kale Chips.